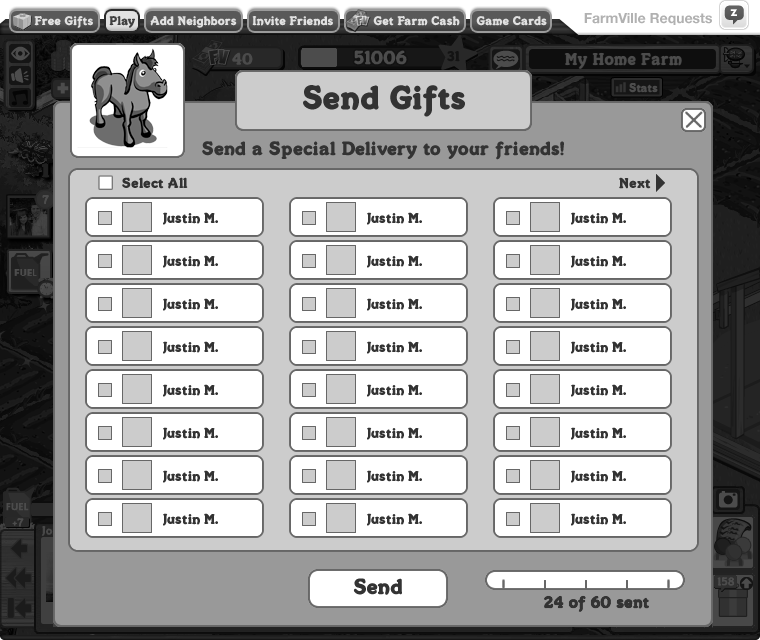 Design Challenge: Improve the way FarmVille players send gifts to each other. In 2012 Facebook allowed third-party developers to access their Newsfeed API more directly. This gave Zynga the ability to redesign their gift-sending experience. I took the lead on the project. Sending gifts to friends was a fundamental game mechanic, and also a primary driver of retention and acquisition. My solution affected 30 million daily active users. I partnered with product management to determine key goals. The first was to increase the number of gifts sent per user, the second was to improve the overal usability of the experience. During the design process we realized that the flow to send gifts was identical to other "sending" processes on Facebook. Therefore this redesign could fundamentally change how items were shared within the game. For the redesign, I solved each of three main pain points. I used a grid to show 24 friends instead of six. I got rid of the scroll bar completely, and used pagination to show more items. After iteration and testing, I also took away the search function at the top of the gifting experience. Players didn't need to use it now, and it was never missed. 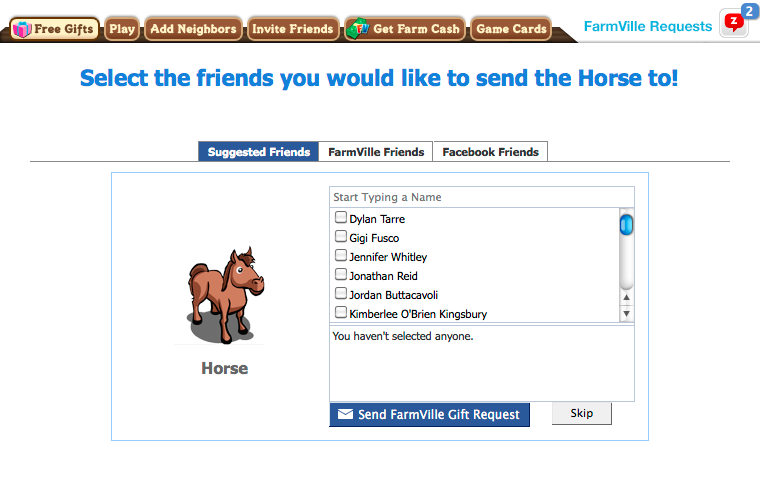 Every feature at FarmVille underwent pre-launch testing within the studio. Since this improvement would affect so many features, we tested the flow rigorously. At launch, we ran an A/B test to determine whether sends increased. We were very happy with the results. Immediately upon the launch of this feature, sends improved dramatically. 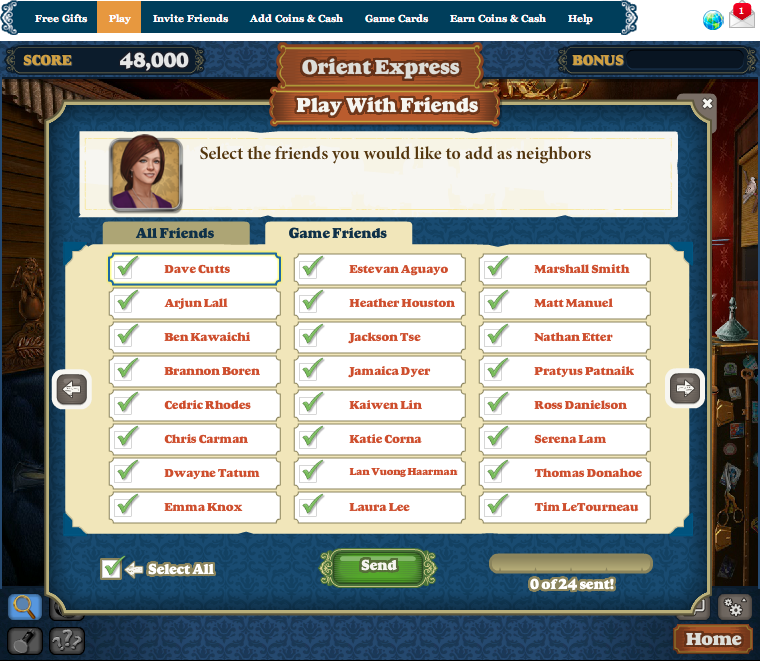 We rolled out the change to each interaction involving sending items to friends, and the results were extraordinary. Other studios noticed our results, and within weeks, other Facebook games at Zynga adopted my design and launched their own interpretation.